Not sure how much your trip should have earned you? This calculator will help you quickly calculate the gross fare of a given trip. The Uber fare calculator will help you compute the estimated gross fare for a given Uber trip. 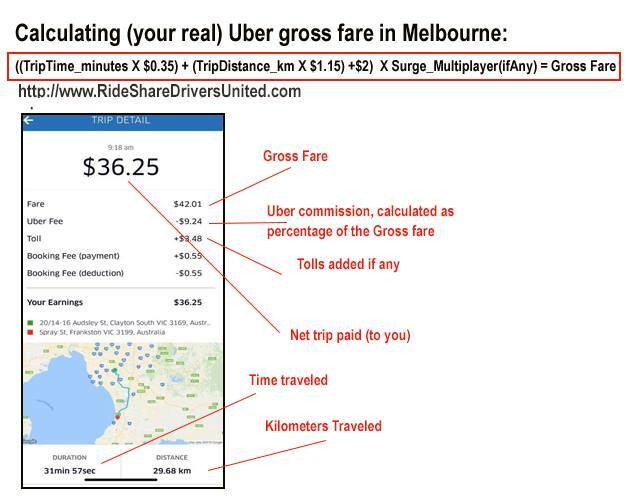 You can than compare the results to Uber’s stated gross fare located on your trips reports and check whether you’ve been short changed. We’ve included a sample Uber trip report (below) to help you quickly find the required variables and compare. &searr; Support the RSDU: The Uber gross fare calculator is available for download as a standalone app. Click the playstore links to install now the Android or the Apple iOS (iPhone/iPad) version. Trip Distance (in KMs or Miles)? Enter required information to proceed. &searr; The Uber gross fare calculator can be installed form the Google or Apple app stores. Click to install the Android or the Apple iOS (iPhone/iPad) version on your device now. Proceeds help with the development costs and support the RSDU work and lobbying activity on behalf of drivers.